Turmeric is tuberous hard root. Purposely turmeric is known as popular spices. Turmeric adds a golden touch to your cuisine. Botanically turmeric is called as "Curcuma longa" and belongs to the ginger family "Zingiberaceae". The botanical name derived from the word "Curcumin" which is a compound in turmeric. Turmeric contains at least 200 compounds among which a very important component "Curcumin" that contribute 3 percent of its natural concentration which is not pretty high. Curcumin is the component which you can find only in turmeric. Curcumin gives this spice its color. The easiest way to absorb curcumin in the body is by adding turmeric to our daily food and drink. Curcumin is fat-soluble, hence boost absorption if taken with the fatty meal. Before we dive into these benefits of turmeric, let's see which turmeric forms are most available and benefits you in most form. Turmeric is most available in powdered and whole turmeric root form. You will find turmeric in other forms like pressed, extract and supplement forms which provides you uncountable preventive and healing properties. Turmeric helps to produce good bacteria for stomach digestion. And also prevents overproduction of acids and bile which prevents bloating. To enjoy this benefit you must consume one teaspoon of turmeric in a day through the daily food you consume. Inflammation is the main cause of many health diseases like cancer, arthritis, heart diseases, etc. Many people opt to drugs like NSAID to reduce inflammation eventually the pain. These drugs temporarily give relief but they can cause side effects like liver problems, stomach ulcers, allergic reactions including rashes, etc. Here comes natural remedy for inflammation, turmeric possesses strong anti-inflammatory properties. Turmeric treats inflammatory diseases and gives complete relief. Turmeric gives uncountably uses for inflamed skin, wound, and internal organ when consumed in its pure decoction form. Free radical in body combines with healthy cells, fatty acids or proteins and then stress up which cause diseases. Aging is the most common sign of oxidative damage. Turmeric has a potent antioxidant property which has the ability to neutralize the free radicals formed in the body and prevents aging. Take 1/2 cup water and add 1/2 teaspoon of turmeric, let it boil for 10 minutes. Let it cool till lukewarm, drink this decoction daily to get relief from oxidative stress. Arthritis is one of the most common forms of chronic joint pain, which actually affected millions of people around the world. Arthritis is commonly seen in aged patients. Turmeric help reduces pain and stiffness in the arthritic patients due to its anti-inflammatory property. To get the best result make a thick paste of turmeric and ginger and add adequate water. Apply this paste on the affected area. Turmeric contains compounds which enhance production of liver enzymes that detoxify our blood in the liver. This detoxifying property of turmeric gives magical hands for our body to be cleaned inside out. Being the sure source for anti-microbial activity turmeric turned a natural detoxifier for internal organs like liver when your body receives turmeric in a readily absorbable form that goes into blood and pass to the liver to assist it in detoxifying. Curcumin enhances production and activity of glutathione a potent antioxidant. Weight gain is another problem of the calorie imbalance in the body. The bioactive compounds in turmeric like curcuminoids prevent fat accumulation in the adipose tissues. This can be useful in avoiding further weight gain or developing belly fat. Weight loss promoting property in turmeric makes similar to green tea through thermogenesis. Ginger also possess this property due to the presence of thermogenic components like gingerols. To get this result, add one teaspoon of turmeric powder into the glass of warm water. Mix it well and drink this decoction daily until you get the desirable result. DVT is deep vein thrombosis in which the blood flow through the veins is obstructed due to the formed blood clots and most commonly it appears on legs. Thrombosis can lead to heart stroke, pulmonary embolism which can be fatal. Turmeric contains curcumin which on a study found to be anti-coagulant which protects the formation of thrombus. In particular, curcumin oil is the safe agent for treating vascular thrombosis. You can use turmeric in the form of paste or oil on affected areas to get relief from DVT. The study revealed curcumin is fat-soluble and it is capable of crossing the blood-brain barrier. Brain diseases like Alzheimer's, Parkinson's, amnesia, etc are noncurable but study suggested that symptoms can be reduced by a few medicines of allopathic or ayurvedic. During the study of turmeric, similar results came up like medicines to boost memory and relieves stress. Curcumin interestingly increases brain levels of Brain-Derived Neurotropic Factor (BDNF) a type of growth hormone that functions in the brain. Curcumin helps to get rid off the amyloid plaques which is developed in Alzheimer patients. Curcumin enhances serotonin levels in the brain and relaxes the brain muscles, makes the mood happy. To improve memory power drink turmeric decoction on daily basis. Therapeutic properties of turmeric relieve sprains, strains and all kind of pains. Turmeric is used from ancestor times to relieve pain and swelling. This magical benefits of turmeric appear because of its anti-inflammatory and anti-spasmodic properties. 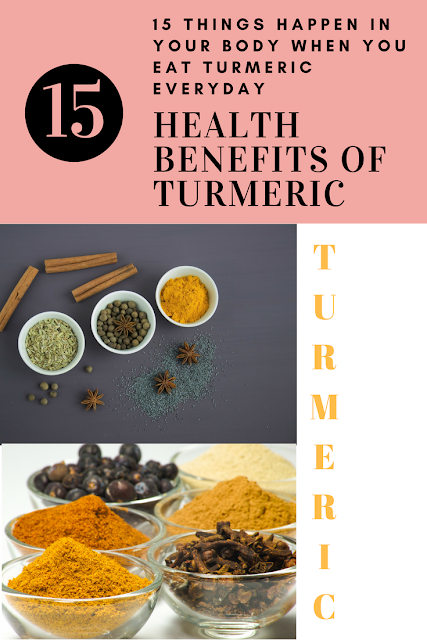 I recommend consuming turmeric with black pepper so it enhances the absorption of turmeric and enjoy these benefits. Cancer is a deadly disease of abnormal growth of body cells and spread from one organ to other. Turmeric has been studied for its potential in reducing the risk of cancer. Turmeric reduces the growth of new blood vessels which promote cancerous cells to grow and spread. Turmeric possesses antibacterial property. Turmeric roots contain other curcuminoids like desmethoxycurcumin and bis-desmethoxycurcumin which helps combat germs, fungi, and bacteria and prevent the body from an infection. Heart disease is the most leading cause of death. Heart disease main etiology lies dysfunctioning of the pumping system, endothelium dysfunction or blood clotting. The researcher studied and proved that curcumin in turmeric improves the functioning of blood vessels or especially endothelium and thus prevent any heart diseases. #note: Those who are on medications of anticoagulants and antihypertensive drugs or people who have naturally low blood pressure, should be careful while consuming turmeric. Turmeric possesses skin lightening and anti-scar properties. Turmeric controls melanin production and thus makes your skin look lighter and brighter. Turmeric has an antibacterial property which aids acne reduction. In addition to this, the anti-inflammatory property of turmeric treats redness and inflammation of the skin around acne. Drinking turmeric milk will definitely give a glow to your skin and keep your skin away from acne and other diseases. Nausea feeling is really hard to eliminate once started while you sick. Turmeric possesses compounds like phytochemicals, vitamins, and minerals which procures healthy brain chemistry and hence, eases mental causes of nausea like stress and anxiety. Turmeric helps in maintaining the insulin level in the body. It also decreases and controls glucose level in the blood. Chances of diabetes are reduced if you consume turmeric with the amount required to the body. I hope this article makes a clear thought that turmeric is the best for your good health. If you have any concerns or feedback then please comment below.